Chop 1 TBSP of yellow onions and clear the leaves off two stems of red chard. Slice the stems lengthwise and then chop into small pieces. Heat 1 TBSP of olive oil and add the onions. Grate about 1/4 tsp of fresh nutmeg on the onions and let them cook until tender. Add the stems and let them cook until tender. Cut a boneless piece of pork loin chop into small pieces and add. Add salt and pepper. Sauté until done. Meanwhile heat water until boiling. Add 2/3s cup water to 1/3 cup of couscous and let steep until all the water is absorbed. Chop the red chard leaves, add to the sauté pan. Cut 4 grape tomatoes into quarters and add to the pan. Cut 5 dried cherries in half. Toss in about 1 TBSP of red wine vinegar. 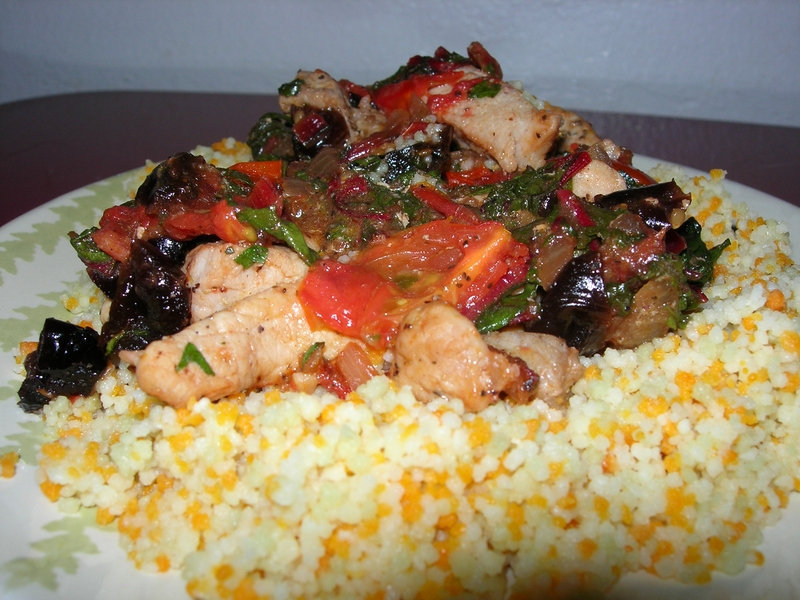 Serve with a bed of couscous and put the red chard and pork on top. It is a delicious blend of hearty chard, sweet cherry and tomatoes and aromatic nutmeg with a dash of sour vinegar. It was a hot day today. I went to the World’s Largest Louie Louie Sing-A-Long downtown so I was not interested in cooking or making anything difficult, but I wanted some rich and complex flavors. 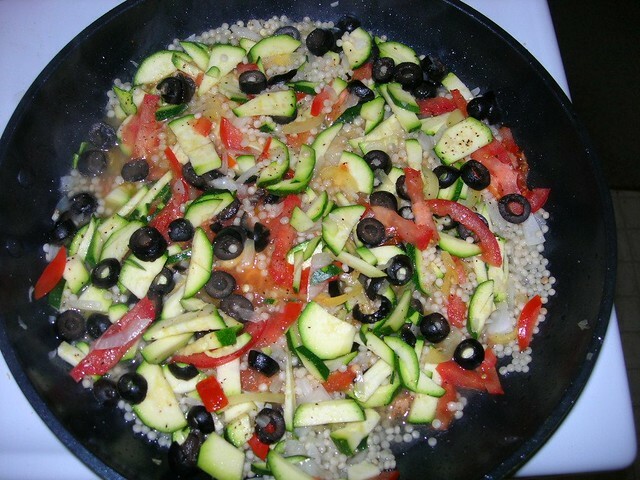 I kind of just started with some couscous and added what appealed until I ended up with something scrumptious. I took 1/3 cup of couscous and poured 2/3rds cup of boiling water on top of it in a small bowl and put a lid on it. While it absorbed the boiling water, I prepped a pomegranate. I used all the seeds from half of a pomegranate. There is a fast and easy way to prep pomegranates. Carefully cut through the skin without cutting deep, leaving the pomegranate seeds whole. Once you have cut through, give a little twist and it will separate into two halves. Take a half and pull and twist the edge a bit to loosen it, then turn it upside down in the palm of your hand and whack it hard over and over and all the seeds will fall out. I only needed half a pomegranate, but I cleaned both halves and stored half the seeds in a plastic container for another day. I toasted some almonds in a clean dry skillet and chopped them in half after they cooled. I cleaned and chopped a bunch of fresh spinach, chopped up some red onion and tossed them in with the pomegranates and couscous. I added some salt and pepper, the feta and toasted almonds. I then chopped up 1/2 of a granny smith apple and tossed in some balsamic vinegar. I put a lid on the bowl I was mixing this all up in, shook it up a bit and refrigerated for about an hour. This was delicious and so rich in texture from the crispy apple, crunchy almonds, tender couscous and the juicy bursts of pomegranate. 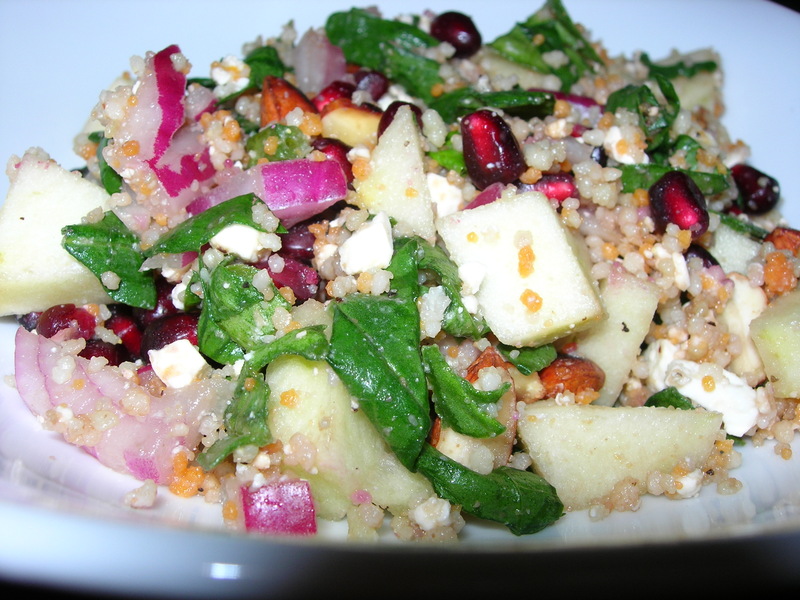 The flavor is grounded in the couscous, the spinach adds a nice fresh taste, the red onions a bit of heat, the apples some sweetness, the almonds some umame and the pomegranate a lovely sweet-sour tang. The feta gives a bit of richness, making it all come together in this big explosion of flavor and texture and color. 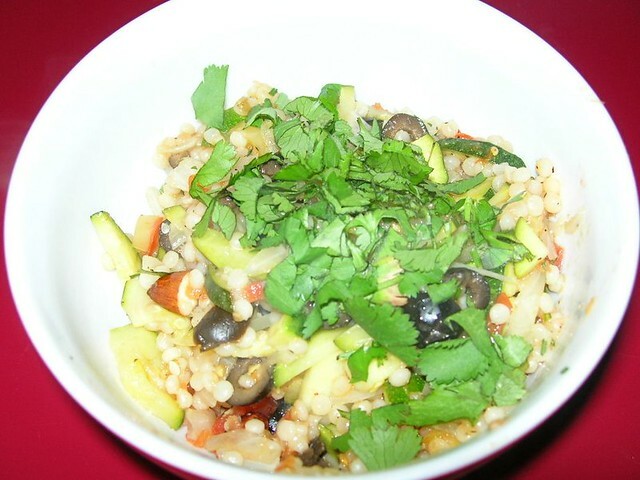 This was a fast and easy supper dish that is incredibly flavorful, filling and delicious with just minutes of cooking. 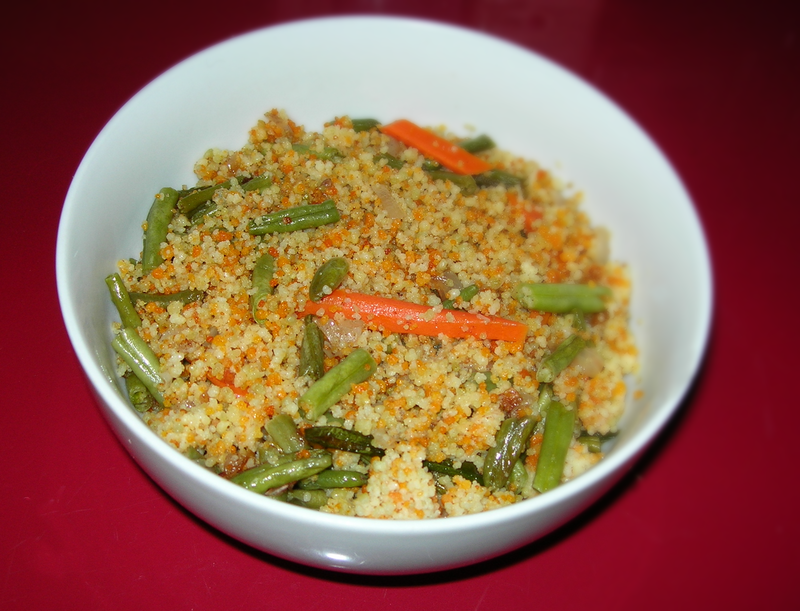 Of course, anything with couscous is pretty quick and easy to make. So, first I heated a tbsp of olive oil in a small kettle with a lid while I chopped 1/2 of a yellow onion and diced 1 clove of garlic. I added the onion and garlic to the oil with some salt and pepper, sautéed for a minute then added 3/4 cup of uncooked couscous and salt and pepper. 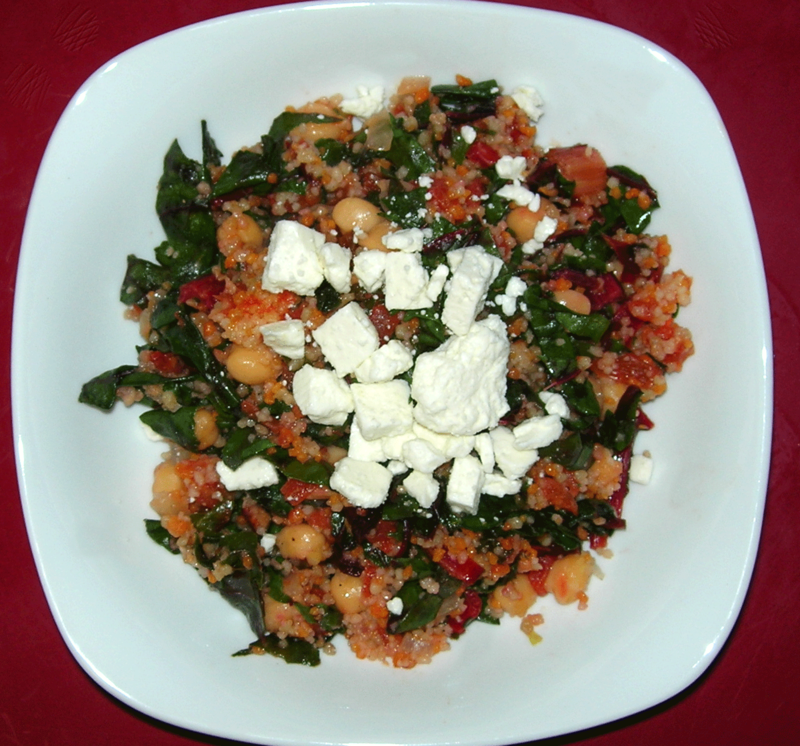 I used the three-color couscous that has been colored with spinach and tomato. I toasted to couscous for about three minutes. Remember to add salt and pepper at each stage of cooking. Adding small amounts incrementally will use less in the long run and develop deeper flavors. While the couscous was toasting, I heated 1 TBSP of olive oil while I chopped up another clove of garlic and the stems of 6 red chard. I added the stems and garlic and salt and pepper and let them sauté while I opened and drained a small can of chick peas (garbanzo beans). After a minute or two, I added the beans. It’s now time to go back to the kettle of couscous. 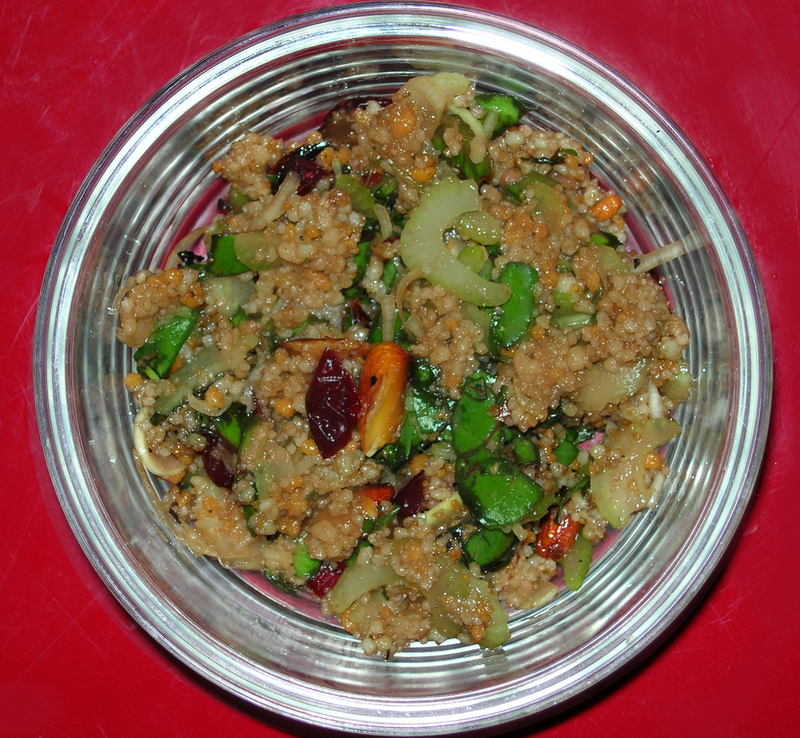 Then I opened a 10 oz can of diced tomatoes with green chiles and added it to couscous along with 1/2 cup of water. I turned the heat up and as soon as the liquid began to simmer, I put the lid on and removed from the heat. I left the lid on for a few minutes until the liquid absorbed (3 minutes or so). By then the chard was done, but if you’re cooking a bit more slowly, just remove the lid and fork the couscous a bit to lift it so it doesn’t get soggy. Turning back the the sauce pan with the stems and garbanzo beans. I chopped the red chard leaves very fine and added them to the stems. I added 1/2 cup of dried cranberries and let everything cook until tender. 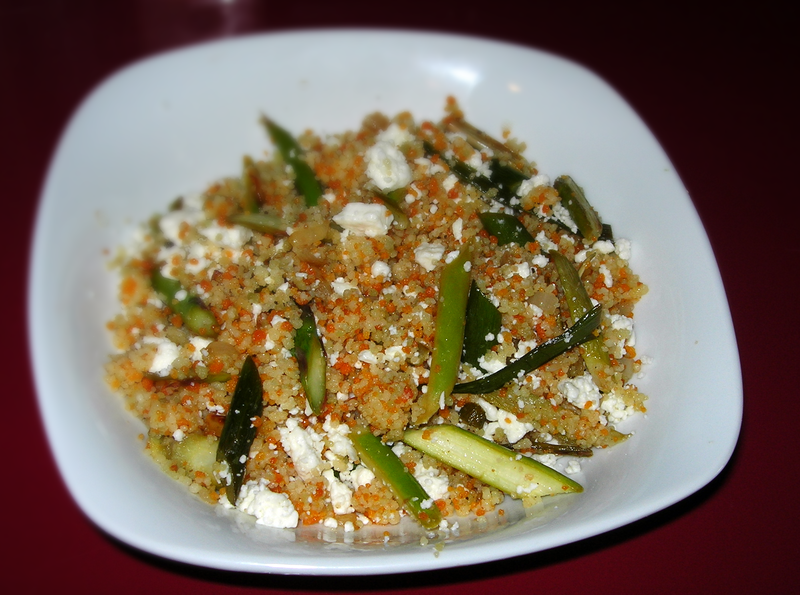 As soon as the chard stems and leaves were tender, I added the couscous and stirred it all together. This made four large servings or eight small ones. The nice thing is that this is delicious hot or cold. 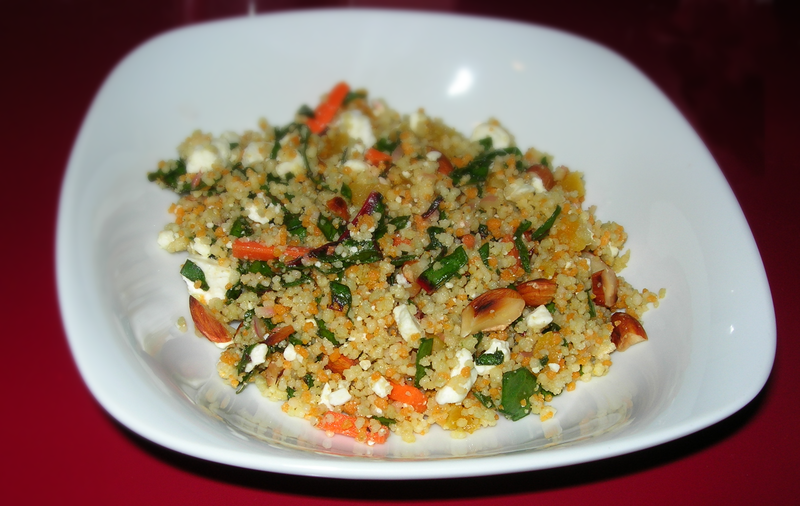 When I served it, I sprinkled feta on top to add a bit of richness, but it is delicious without the feta, too. Without the feta, it is a nice vegan main dish. The chard gives it an earthy depth that is offset by the heat of the diced tomatoes and chiles and the sweet cranberries. 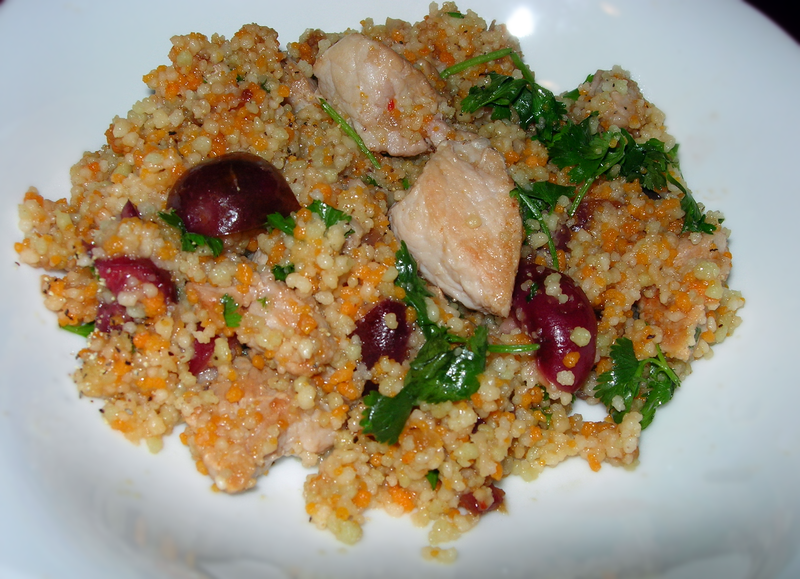 The couscous is light and airy while the chickpeas add substance. The feta adds a nice bit of salt and fat that make it more filling and satisfying.